Falcarius Utahensis' discoverer is presently unknown, & was picked up through the popular black market trade of dinosaur fossils. It was part of a fossil graveyard, where many animals became fossilized due to either a mass event such as a large mudflow or excellent fossilization conditions over a long perios of time at the site. Falcarius is an exciting discovery as it represents the earliest known Therizinosaur, odd dinosaurs that were covered in feathers, with long necks & claws used possibly in either digging up roots or as an aid for pulling high branches closer to the mouth. Falcarius puts this family into the Maniraptoran clade, along with Oviraptors, Ornithomimosaurs, Alvarezaurids, Troodontids & Dromaeosaurids, the last being popularly known as Raptors, & includes Velociraptor. 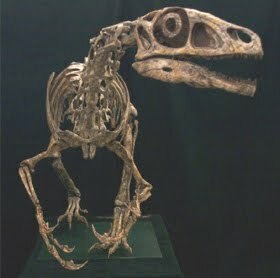 It is unlikely that Falcarius is related to Velociraptor, but the Dromaeosaurids are the Therizinosaurids' closest known relatives, having both descended from a common unknown ancestor. The most interesting point about Falcarius & the Therizinosaurs, however, is that while being related to what are billed to be the name Dinosauria's most efficient killers, the Therizinosaurids were probably herbivorous, although Falcarius may have been omnivorous.